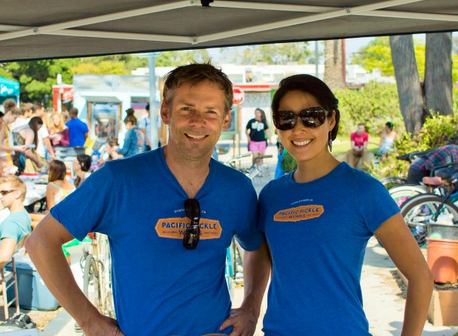 Food vendors, music, and University of California, Santa Barbara students took over the 65 block of Seville to celebrate the Isla Vista Food Co-op’s 40th anniversary. The event, entitled “The Greatest Story Ever Told: Celebrating 40 Years of the Isla Vista Food Co-op,” included live music, yoga, capoeira, and attracted UCSB organizations like the Environmental Affairs Board and the Food Bank. The event offered attendees entertainment as well as food and merchandise that promoted the Co-op’s ideals of serving natural and healthy products. The Co-op offered samples of some of their own food at the event, handing out information about the Co-op and the new food pyramid the Co-op Kitchen Manager Madia Jamgochian recently published. With the Co-op recent purchase of the building they occupy, the Co-op plans to continue expanding and Jamgochian’s department is one of the first areas planned for growth. Local food vendors offered up samples of bread, salsa, lavender lemonade, and other items, while crafting workshops taught people how to make seed bombs, crochet, and tie-dye t-shirts. Anne Altamirano, owner of Mesa Salsa Company, the new specialty salsa company based in Santa Barbara, offered samples of her company’s salsa to hungry IV residents and said her products were available through the Co-op. UCSB clubs and organizations also attended the block party, taking part in the event and informing attendees of their services. Chellsee Lee, the Clean Energy Chair of the UCSB Environmental Affairs Board, tabled in front of the Co-op and said she was enjoying the atmosphere the block party encouraged. Lee insisted that the event was not only for environmentalists or those who shop at the Co-op. Associated Students Food Bank was also at the event, and committee chair Erick Lankey said the Food Bank and the Co-op have cooperated in the past. Lankey said the Co-op has donated food and given the Food Bank Co-op credit to ensure people with dietary restrictions can still find options at the Food Bank.